Kite flying: small kites, big kites, fighter kites, specialty kites. Vanier Park is home to the Pacific Space Centre - Vancouver, Vancouver Museum, and Vancouver Maritime Museum. Vanier Park is just a hop and a skip to Granville Island - Vancouver. Kitsilano Pool and Beach is just another hop and a skip west of Vanier Park. It's right on the water so you can see all the boats entering and leaving False Creek. Free unless you go to the museums. Proximity to attractions, and something for everyone. 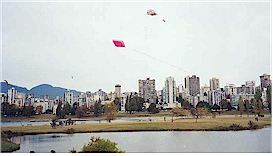 If you've seen enough of kites, you can take a 5 minute walk to Kitsilano Beach, or Granville Island. Vanier Park is at the North foot of Chestnut St.
A relaxing place to lay back on the grass and watch the kites soaring in the sky.